My basic rule for frosting thickness on a cake is about 1/4 inch if your not using fondant. 1/4 inch is always too much for frosting haters and never enough for frosting lovers, but a good in between the two camps. I go even thinner when I’m covering a cake with fondant because if you go to thick the fondant will squeeze out quite a lot of the fondant and you’ll be left with a pillowy soft look instead of nice sharpish corners! I hope this was helpful! Here is a classic buttercream recipe (again- same as the last videos). Any buttercream recipe will work, just remember to use THIN (not thick or medium) for frosting a cake. If your frosting is too thick you’ll get tons of crumbs and basically rip apart your edges. 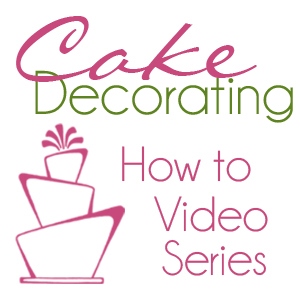 The frosting in this video is on the thin side of thin, you can go a bit thicker and still get great looking frosting! Haha, I need all the decorating help I can get. :) Thanks so much! glad someone likes them! I hope it’s helpful in some way!